If you’ve ever traveled abroad, you know how annoying it can be to keep track of all the plugs and converters needed in different countries. The FosPower International AC & USB Charger is an essential travel companion that let’s you charge in 150 different countries with just one adapter. Right now, you can pick one up for just $20 + free worldwide shipping. Having an all-in-one charging solution is essential when traveling. 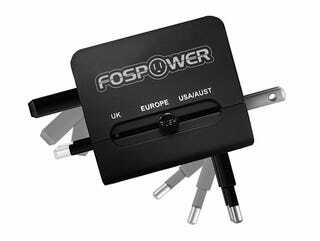 The FosPower International AC & USB Charger is a top-choice, as indicated by it’s4.5 star rating on Amazon. For just $20 + free worldwide shipping ($14.99 shipped to the US), it’s a no-brainer to add this to your must-have travel gadgets. Head to the link below for more info and grab yours today.